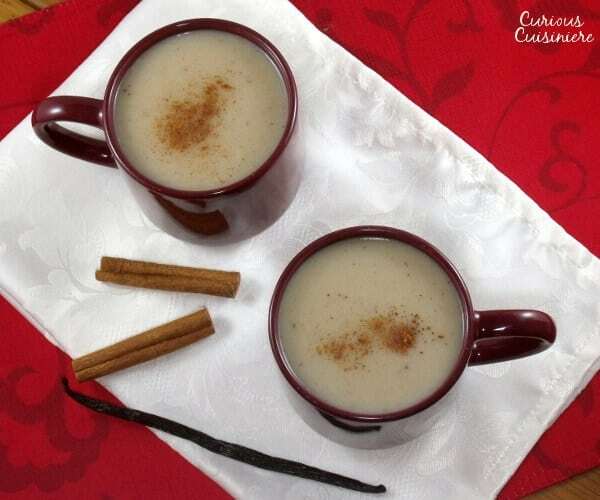 A warming drink perfect for winter, this Mexican Atole recipe is full of the comforting flavors of vanilla and cinnamon. 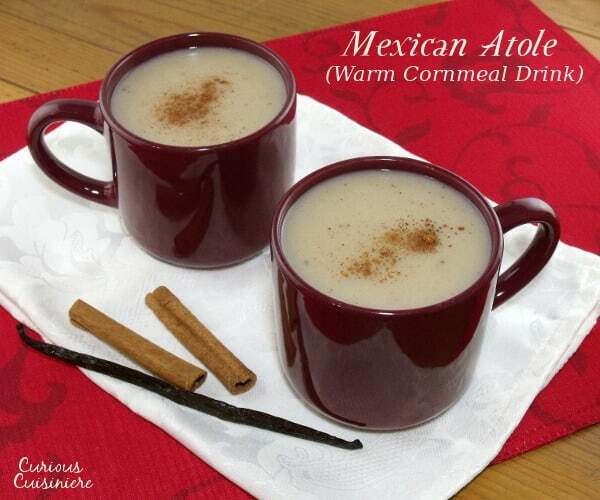 Atole (pronounced ah-TOH-leh) is a traditional Mexican warm beverage made from masa harina, the type of corn flour that is traditionally used to make corn tortillas. It is a popular breakfast dish that dates back to the time of the Aztecs and Mayans. 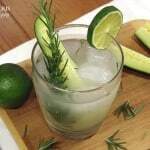 It is traditionally drunk at celebrations of Dia de los Muertos, or the Day of the Dead, a celebration that happens on November 1 and 2 to celebrate and remember those who have passed away. 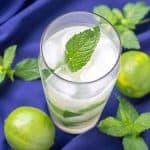 The drink is often eaten for breakfast or as an after dinner snack. It’s consistency reminded us of a thin cream of wheat, so it makes sense that it is often served for breakfast like cream of wheat or oatmeal. Atole de Vainilla, the version we are sharing today, is flavored with vanilla and cinnamon. 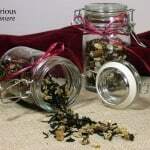 The warm, spicy fragrance makes this beverage incredibly inviting, even before it is poured into the mugs. The process to make atole is incredibly simple. Just like making cream of wheat, you simply simmer the masa with milk, water and the spices. The consistency can vary from thick and porridge like to thin and pour-able, depending on how much liquid you add. 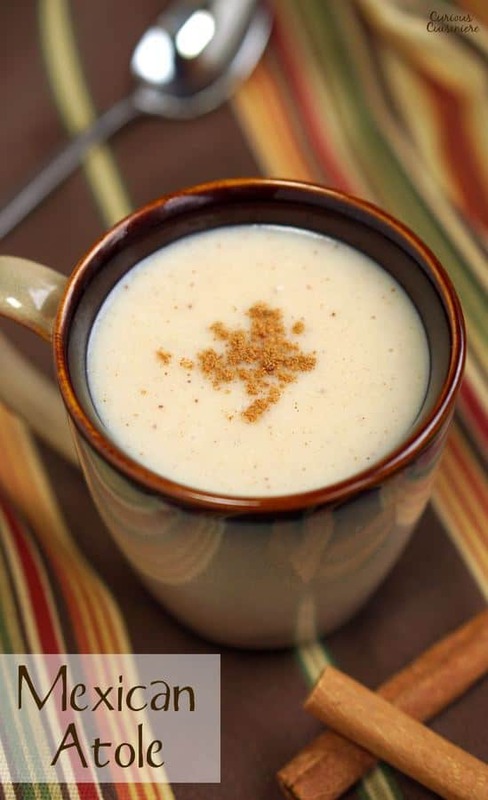 Our recipe makes an atole that is thick, but still drinkable. However, if you prefer yours on the thinner side, just add a little more milk. Atole is traditionally sweetened with piloncillo (pronounced PIL-on-SE-yo), an unrefined cane sugar that is pressed into a cone shape. 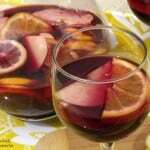 It has a flavor issimilar to brown sugar, with a deep molasses punch. 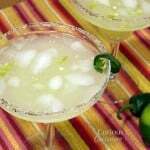 You can typically find piloncillo at any Mexican grocery store and online. If you have a hard time finding piloncillo or don’t live near a Mexican grocery, don’t worry. 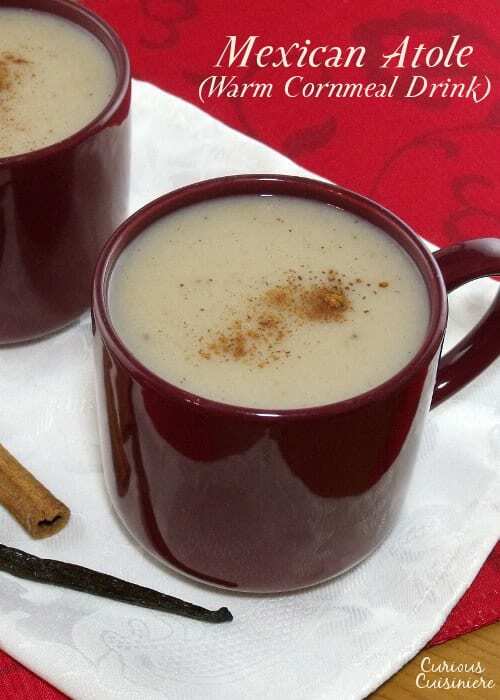 You can mimic the flavor of piloncillo in atole by using brown sugar. 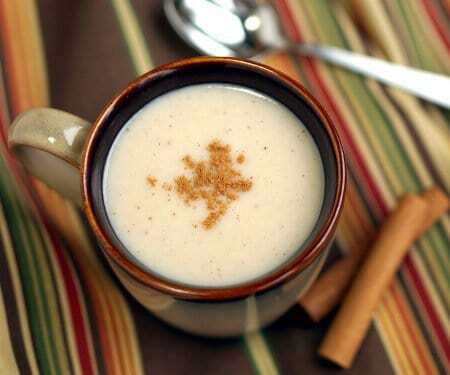 A warming drink perfect for winter, Mexican Atole is full of the comforting flavors of vanilla and cinnamon. In a medium saucepan combine masa harina, water, milk, piloncillo (or brown sugar), and cinnamon. Whisk the mixture to combine. Bring it to a simmer over medium high heat, whisking often. Reduce the heat to medium and simmer the mixture for 5-10 minutes, whisking often, until your desired consistency is reached. Remove the atole from the heat and whisk in the vanilla. Serve hot or warm with a pinch of cinnamon to garnish. This recipe from 2015 was updated in Feb 2017. 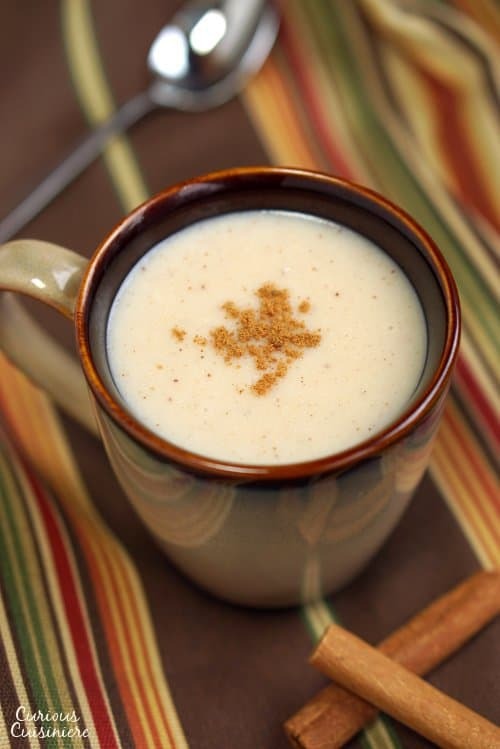 We made the atole even better! Enjoy! Today the Sunday Supper tastemakers are celebrating warming dishes from soups to stews, even drinks and desserts! Take a look at the comforting recipes below and get ready for the cooler temperatures to roll in! I like my mother’s version, which is made with Mexican chocolate and all milk instead of the milk/water combo. The chocolate (xocolatl) is presweetened, no need for piloncillo. I think it might call for a stick of canela to be boiled along with the mixture, but powdered cinnamon would be just as good. This sounds delicious! We have been meaning to try a chocolate version! I made this and it was amazing! I was a little apprehensive since my boyfriend has been spoiled with his mother’s delicious and authentic Mexican recipes growing up. I think I make will be as good as hers. My toughest critic LOVED IT and even finished the rest of it!!! I even loved it and I don’t like anything cinnamon flavored. The only thing I did different was use actual cinnamon sticks versus the powder. I placed three sticks and let it boil with the rest of the ingredients. It tasted delicious. Before I served it, I added an extra splash of vanilla and one more scoop of brown sugar. 5 stars!!! All day I kept daydreaming about having some more! Good job on the recipe! Thank you Adriana! We’re so glad you enjoyed it! It looks/sounds like it would be delicious. Do you know if it would be as tasty if made with a non-dairy milk, such as almond or coconut? Thanks! Hi Christi! I don’t see why you couldn’t use almond or coconut milk to make the Atole. It would definitely be worth a dry. Let us know how it turns out for you! Oh yes! It is one of our favorites! Thanks for stopping by Melanie! Thanks Mario! We’re so glad you enjoyed it! This one has always fascinated me, definitely looks comforting! I vote the thicker the better! Great recipe for a warm breakfast. You know I think I somehow never managed to have this in Mexico – I was there more in the warmer months which may be why, but I remember hearing of it now I see your recipe. Must give it a try! Sounds interesting and different. I have to try this! 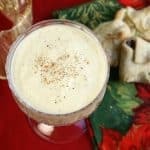 I posted a kind of tea drink using barley flour on my blog a while back but have never heard of cornmeal. Sounds great! 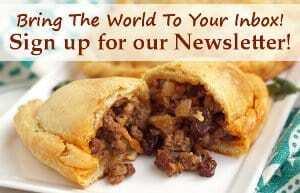 Ooh, we would be intrigued to try one with barley flour! I bet barley meal would make for a very unique version! We’ll have to give it a try! What wonderful flavors! Perfect for a chilly day! Yum! I have masa harina in my pantry right now. Will definitely need to try this. It is such a fun way to use up leftover masa! You always have the most intriguing recipes! Another new one for me—but I’d sure love to sip one with you! Thanks Liz! 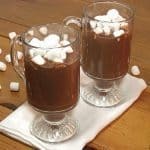 We love warming winter drinks, and this is a fun way to switch things up! I love cream of wheat so this sounds delicious to me. You would love it Wendy! This sounds so inviting! 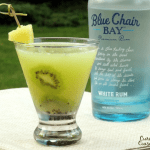 I’ve never heard of this drink, but may have to give it a try as the cooler weather gets going here. We will be drinking it often now that the weather is getting cooler! I think I had something similar when I was in Guatemala. It was delicious! I think a lot of the regions in that area have variations on this drink. 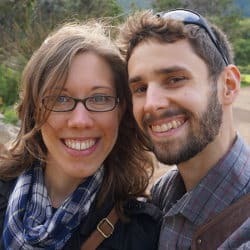 Wonderful to hear your experience! I have never heard of this before but it sounds so warm and comforting! It is the perfect drink to curl up in front of the fire with! Wow! I had heard of this before, but I didn’t know what it was. How interesting! It’s so easy to make too! Looks delicious and so warming and soothing on a cold day! Love all the information too! That’s understandable 🙂 Wine is hard to replace!